Amazonian has a forest green jelly base densely packed with green microfleck shimmer. Something, isn't it? It's similar-ish to Wet n Wild Poison Ivy (the giveaway ends at midnight! ), but not a dupe. 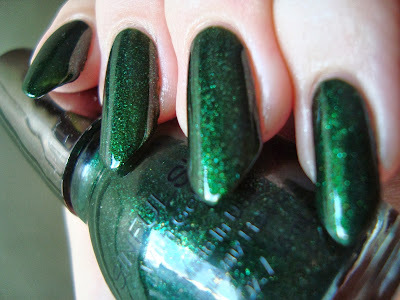 It has a green base, not blackened, and much larger shimmer. The formula's on the sheer side, so I used three coats to make sure it covered the patch. It goes on smoothly and beautifully, so the extra coat was no trouble at all. Bottom line: Oh my, yes! Very yes! In case you missed the reminder above, Wicked Winnings Wednesday #1 ends at midnight tonight! Hurry hurry! The second giveaway starts at midnight, and you can "sneak in" early (before the post goes up tomorrow) if you want, by entering on our Facebook Page through the Giveaway tab. It won't help your chances or anything...just figured I'd mention it. Good luck to everyone who entered! I always get so excited drawing prizes! I feel your pain with the claw break! I had the exact same thing happen RIGHT before my friend's wedding, I was frantically trying to patch it while worrying about packing and getting to the airport. Not fun! I love love love this color, it's the only SinfulShine I have so far. Oh no! That's awful timing! It's a great color. I'm liking the SinfulShines in general so far.